It's that time of year again. Thinking of Mardi Gras and missing a bit of New Orleans. So. . . I've got rice, sausage, shrimp (actually they are prawns) and hmm. . . what should I make? Oh Yeah, Jambalaya!! Back in 2009, I went to New Orleans on a congratulatory trip. I had quit smoking and I wanted to celebrate and go somewhere. During my stay, I attended the New Orleans School of Cooking Lunch Class Demo. 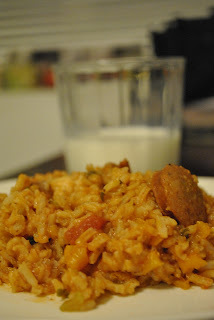 They made a Jambalaya that was just great! 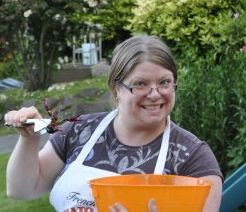 The following year, for my wonderful cousins birthday, we did a Cajun Themed Backyard Party. 30 lbs of crawfish later. . . we had more than enough food and everyone enjoyed Everything. Best party thus far. So every once in a while, I get to missing NOLA and I make something. 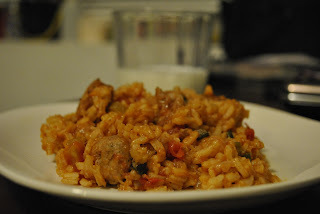 I used my Class Act recipe and made some jambalaya, with a few twists! Cook Shrimp and sausage in oil (or use butter). Saute until shrimp are cooked, remove sausage & Shrimp, set aside. In pot add celery, onion, green pepper, garlic and add 1 tsp paprika. Add stock & Cajun seasoning, bring to boil. Now, adjust color by adding more paprika if you wish. Add Rice, return to boil. Stir Rice from bottom to top. Cover and cook additional 15 minutes or until rice is done and most of the liquid is absorbed. Here's how mine turned out. I used too much 'Cajun' seasoning, so mine requires some milk. Yum. Now I should've made those hush puppies too. . .
Stay Tuned for more great foods! !